Make sure your event or conference site is working hard to attract and engage potential delegates. Shameless plug here as this is a course I am delivering for The Media House. However if you think your site could be better or your inbound marketing improved this could be the course for you. The course will provide a robust structure for reviewing existing SEO for your events and the strategy/tactics, tools and techniques needed to improve and maintain it. As a real bonus there is a special offer – buy this course with the Online Marketing Day and get £100 per person off the total. Discount code at the bottom of this post. Below is what will be covered on the day. (If these points ring a bell with you as areas that need work for your online activities click the link and book a place). How it works – You need to know what the rules are to play in the game.Keywords, Page Rank, Trust & Authority, Linking. Review the most important factors that you can control. Rules update – Google, your biggest source of traffic, has made changes.Penguin (Links from “bad neighbourhoods” and exact Anchor text) and Panda (Quality not “thin” or duplicate content). Who is my audience – Identify specific target groups and segments for a specific site, identify their interests. What do you want them to do – set goals and targets. Every page should have a purpose. Key Words – Making sure that the content on your site matches the interests of your target audience using Branded and non branded terms. Relevance will equal success. Keyword discovery – Where to look and how to choose. Google Keywordtool/your own site/Google Analytics/Webmaster tools. Have a Master List to use whenever you create any content for the site. Segment the list – Organise the keywords into specific themes.Focus – General terms = high search volume but low specificity & higher bounce rate. Long tail = low search volume higher degree of intent and better visitor retention. Deployment on the page – Page title, meta tags and descriptions to page copy. Placement of keyword in URL. What can you affect on your site? Who is in charge? Body copy – Be natural, don’t over stuff with keywords. Allow the keywords to inspire your text. Link to related pages in the text. Where to find your content? Linking, trust and authority – Inbound links are votes for your site but some votes carry more weight than others. Quality links from authoritative sites transfer their clout to your pages. Social media likes, shares and tweets are all endorsements for your page. Make it easy for your visitors to share your content or add their comments. Engage with them, have a conversation. Where to look for links. Content – How to match it to your objectives. It’s not about you. Why will your visitors link to it? Where to place it? Get your voice right (site persona). Lifecycle and frequency – Your web presence extends the life of your event from days to months. Maintain site and content year round to preserve links – grow trust and authority. Publish content on a regular basis to ensure you get frequent visits from search engines. Regular updates allow you to email or social media updates to your registered user base. 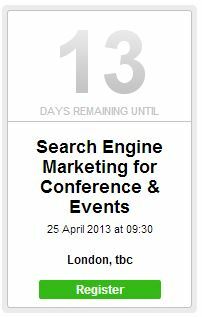 If you want to improve these areas for your event SEO and inbound marketing book now. See you there? Course price is £495 per day but get a reduced rate of £100 per person off your total cost if you book with the Online Marketing day. Quote SEO2 by 15th April to receive this discount.